If the holiday season is giving you some family time, you and your kids can together enjoy a rollicking tale of derring do set in Merry Olde England: 1938’s The Adventures of Robin Hood. Famous as the film that made swashbuckling Errol Flynn a household name, it’s also historically important as Warner Brothers’ first foray into glorious Technicolor. The plot is of course familiar and has been adapted dozens of times: When King Richard the Lionhearted leaves the country, his heartless brother John begins terrorizing the peasantry. The courageous noble Robin of Locksley voluntarily leaves his comfortable life to fight for the oppressed. becoming a daring outlaw who along with his Merry Men takes a personalized approach to progressive taxation. Along the way Robin wins the love of Lady Marian, who becomes a brave advocate for the downtrodden despite her blue blood. This was a big budget film, with lavish costumes and sets designed to show off the possibilities of Technicolor photography. It’s also big in other ways: Huge battles, extended sword fights, heroic stunt work and full-blooded performances by the whole cast. For raw entertainment value alone, this is a Hollywood studio system classic, and was deservedly selected for preservation in the National Film Registry. Despite being wracked with numerous health problems in real life (He died at 50 with the body of an old man), on screen Flynn is the apotheosis of the virile, roguishly charming man of action. He was working with his frequent director Michael Curtiz (Who also directed Flynn in the thrilling Captain Blood and went on to make Casablanca), who clearly knew how to get the most out of Flynn. 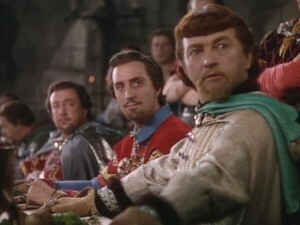 Flynn gets outstanding support from the rest of the cast, including Claude Rains as a fey Prince John and Basil Rathbone as the dastardly Sir Guy of Gisbourne. Olivia de Havilland, who worked with Flynn on eight films, was cast more for her looks than talent in her early career, but she became a better actress over time. She’s good enough here at portraying Marian’s growing awareness of the plight of the poor and her own love of Robin. The actors in the smaller parts also do well, especially Eugene Pallette as Friar Tuck. This is a particularly good film for kids, not only because the exciting story is easy to follow but also because it embodies admirable values. I love all the ethical shading of film noir, but there is also a place for movies that teach uncomplicated moral lessons: The rich have an obligation to the poor, and good people must fight back when the strong exploit the weak. Roger Ebert, who loved this movie, said it beautifully: “In these cynical days when swashbucklers cannot be presented without an ironic subtext, this great 1938 film exists in an eternal summer of bravery and romance”. 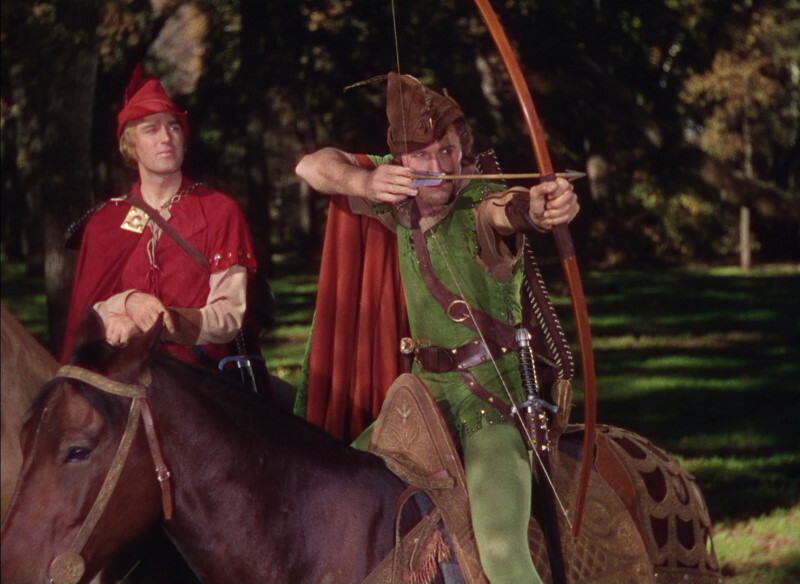 Before closing my recommendation of this rousing classic, I leave you with two notes of trivia (1) The 1922 Douglas Fairbanks Sr. version of Robin Hood was filmed in Bidwell Park in Chico, California, and the Flynn version returned there for some of its shoot. (2) Much of the film was hilariously parodied in one of my prior recommendations, The Court Jester, with Rathbone sending up his own performance. Good acting and all, but a little too much Saxon violence, no? That amazing split-the-arrow shot? The real archer, Howard Hill, actually made the shot several times but the second arrow kept breaking just the end of the first, not the length of the shaft, so in the end they had to fake the shot. It's a heck of a cool trick. A Methodist minister in my hometown, Stacy Groscup, could split aspirin tablets thrown into the air with his bow and arrow. It's a fine movie, but Mel Brooks did have a point. Tights? And yet with all these goodies we fail to mention the magnificent sound track by Erich Wolfgang Korngold?